Change Living is delighted to share the news that its Redcliffe Parade development in Bristol has been named the winner in the 2018 Michelmores Property Awards, Residential Category (35 units and under). With Alec French Architects, Change Living’s Kay Persaud accepted the award on behalf of the entire project team. The Michelmores Property Awards showcase and celebrate the very best of the South West region’s projects, buildings and businesses, recognising both commercial and residential projects of all shapes and sizes across ten categories. 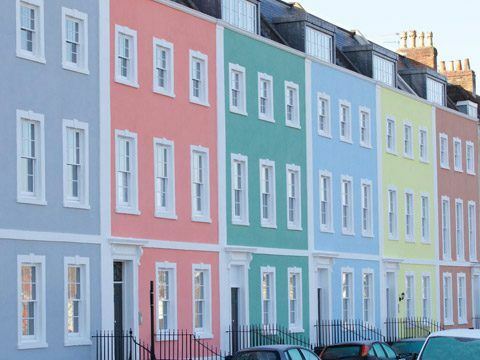 The renovation of one of the most recognisable Georgian Terraces in Bristol has seen the return of the six townhouses at 3-8 Redcliffe Parade West back to their original residential use, and now newly painted in distinctive pastel shades. Change Living has created 16 apartments, all overlooking Bristol’s Harbourside. Many original features, such as cornices and timber panels have been retained and restored within the beautifully proportioned apartments, and where they were missing, new ones crafted and fitted to match. Prior to this renovation, the townhouses at Redcliffe Parade were used as commercial offices. The Terrace, which dates back to 1768, had a variety of uses throughout its long history, including a school and even a drapers shop, as well as individual houses. It’s not just the Georgian Terrace that Change Living has transformed. In the 1970s an office block was built behind the Terrace, facing onto Jubilee Place. This too has been included in the renovation, and is now home to 14 two and three bedroom apartments, including a stunning coach house. Ron Persaud, director at Change Living says, “We purchased the terrace back in 2015, and since then we’ve been working hard with our architects, designers, contractors and specialist craftsmen to recreate the character of these amazing properties, that had been sadly lost over time. Now, with residents beginning to move into their new homes, the terrace is coming back to life. “The Grade II listed façade of the terrace is such an iconic feature of the city, we had a responsibility to get the renovation right. We’re delighted with the end result, and are honoured to be contributing to the city’s character in this way. The new homes at Redcliffe Parade and Redcliffe Place are on the market with Knight Frank on 0117 317 1999 or Ocean Home on 0117 946 9838 or visit www.changeliving.co.uk for more information.